Advantages: High quality decals in perfect register; full colour instructions; fascinating markings. Xtradecal continue to produce excellent quality decals and once again they have not let us down with the issue of this sheet. 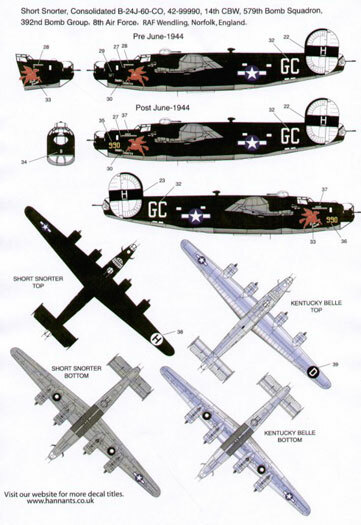 They have produced yet another fine quality decal sheet depicting markings for the Consolidated B24J Liberators. The decals are recommended for the new 1/72 scale Hasegawa kit but can be used on any of the older B24J kits from Academy, Airfix and Revell. The decals are superbly printed and they have good colour saturation and are in perfect register. As usual with Xtradecals the carrier film is ultra thin and my experience with their decals in the past has been that the decals have to be handled carefully and will snuggle down into the surface detail well. The carrier film then almost totally disappears under a coat of clear. B-24J-190-CO, 44-40973 “The Dragon and His Tail” of the 64th Bomb Squadron, 43rd Bomb Group based at Ie Shima in August 1945. This aircraft is finished in overall natural metal with an olive drab anti glare panel. The horizontal stabiliser has a black diagonal stripe while the rudder has red horizontal stripes. A large naked lady being held by a green dragon is painted on the right hand side of the nose with the motif “The Dragon and his tail” pained in front of the Dragon. A set of decals portraying the outline of the Dragon’s tail is also provided as the Dragon was progressively painted in between sorties. B-24J-155-CO, 44-40268 “Kentucky Belle” of the 706th Bomb Squadron, 446th Bomb Group, 8th Air Force based at Bungay in Suffolk England. This aircraft is finished in overall natural metal with an olive drab anti glare panel. The horizontal stabiliser is painted in yellow with a large has a large black horizontal stripe painted across the mid section. 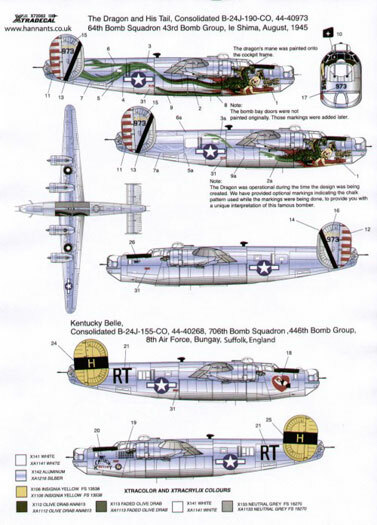 A large red heart with a lingerie clad lass is painted on the right hand side of the nose while the words “Kentucky Belle” are painted on the left along with the bomb mission markings. B-24J-60-CO, 44-99990 “Short Snorter” of the 14th CBW 579th Bomb Squadron, 397th Bomb Group, 8th Air Force based at RAF Wending in Norfolk England. This aircraft is finished in Olive Drab upper surfaces and neutral grey lower surfaces. The horizontal stabiliser is painted in white with a large has a large black horizontal stripe painted across the mid section. A large red winged horse is painted on the right and left hand of the nose while the words “Short Snorter” are painted beneath the horse.